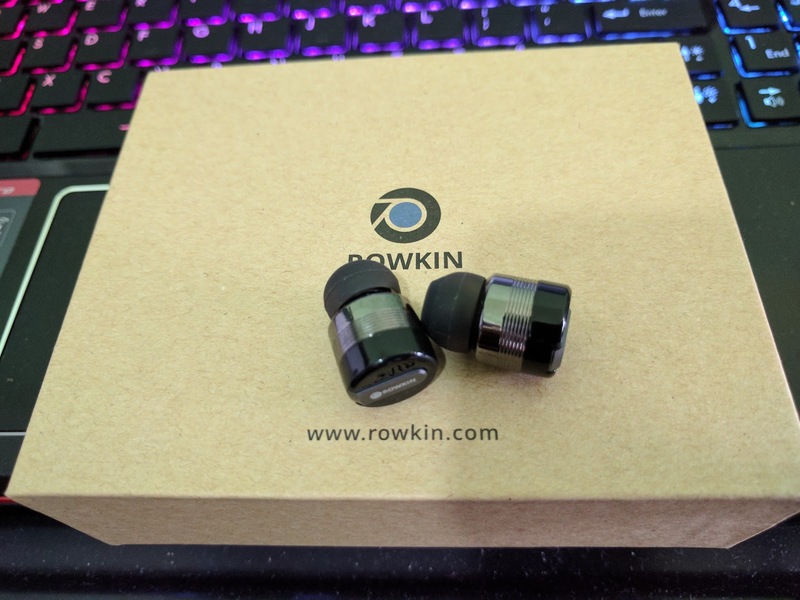 Rowkin has mastered the art of truly wireless earphones. They make the smallest wireless earphones in the market today. Their Rowkin Bit series - with Bit Charge and Bit Stereo - is the most popular, while they have the Rowkin Mini Plus+ and the Rowkin Pulse in the lineup. I have got a Rowkin Bit Stereo very recently. And, I have to say they exceeded my expectations. The earbuds are tiny! 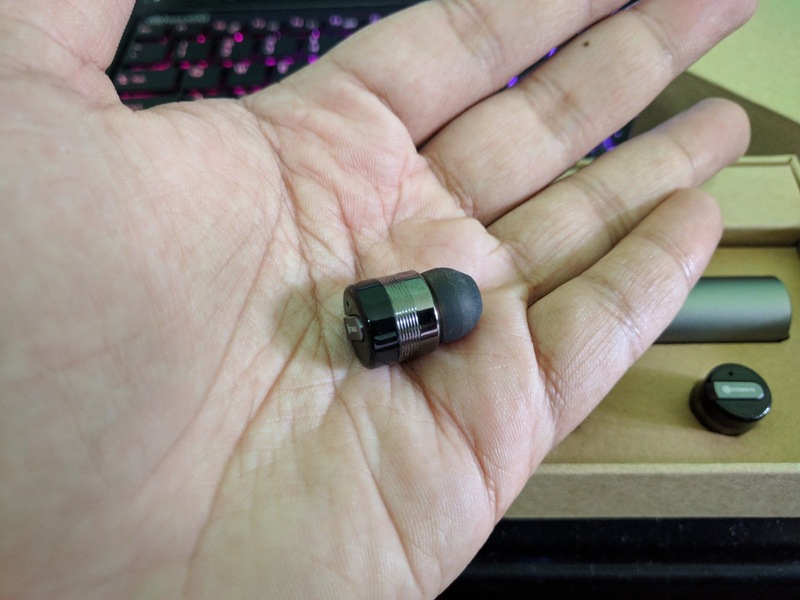 They were much smaller than what I expected from the product images. That's a good thing: the smaller the better. Any smaller and I would guess they'd go in to the ear cavity. When you buy it, it comes in a nice little box, which you can keep using as a storage box when you are not using them. Inside, you have the 2 Rowkin Bit Stereo earbuds, and the charging case. The charging case is cylindrical, with a slightly larger diameter than the earbuds themselves, and about 8 CM limg (~3 inches). 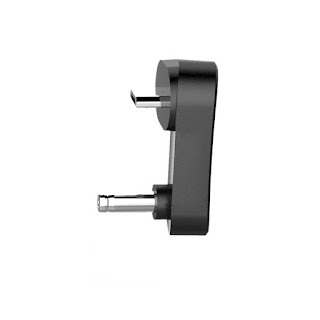 The charging contacts are at the inner edge of the circle and the pin in the middle. You basically pop in the earbuds, at the two ends of the charging case, which gets attached magnetically. The earbuds will have a red light when charging, which will turn off when the charging is complete. The charging case itself can be charged by splitting its two pieces - which are again held magnetically - and plugging in the included micro-USB cable. The box also comes with the mentioned micro-USB cable (it's quite short however), and a set replacement of ear-tips in different sizes (small, medium, large). 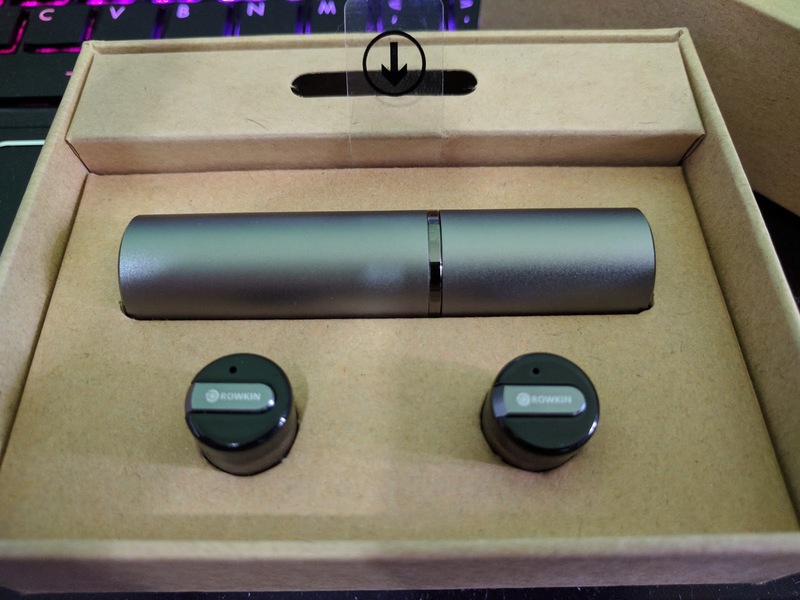 Each of the two earbuds can work independently - they are identical - or, they can be paired together to make them stereo. 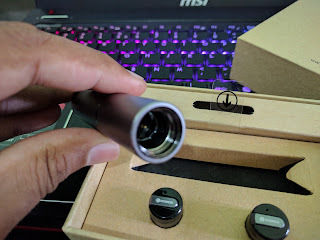 To connect just one earbud with your device, press and hold the button on the earbud for 6 seconds, until the LED on the earbud starts flashing red and white alternatively. Then, search for "Rowkin Bit S" from your device and connect. Once pairing is complete, the earbud will be flashing white. To pair the two earbuds together to make them stereo, make sure they are first powered off, and then press and hold the button on both of them for 6 seconds, until both of them are flashing red and white alternatively. Keep the two earbuds close together. They will pair with each other automatically, which should take 10 - 30 seconds. Once paired with each other, one earbud will be flashing white, and the other will be flashing white and red alternatively (indicating it's the primary, and ready to pair with a device). 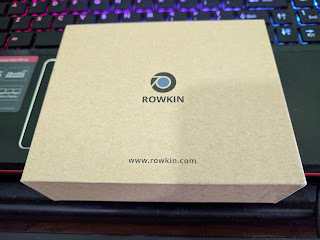 Now, search for "Rowkin Bit S" from your device and connect. 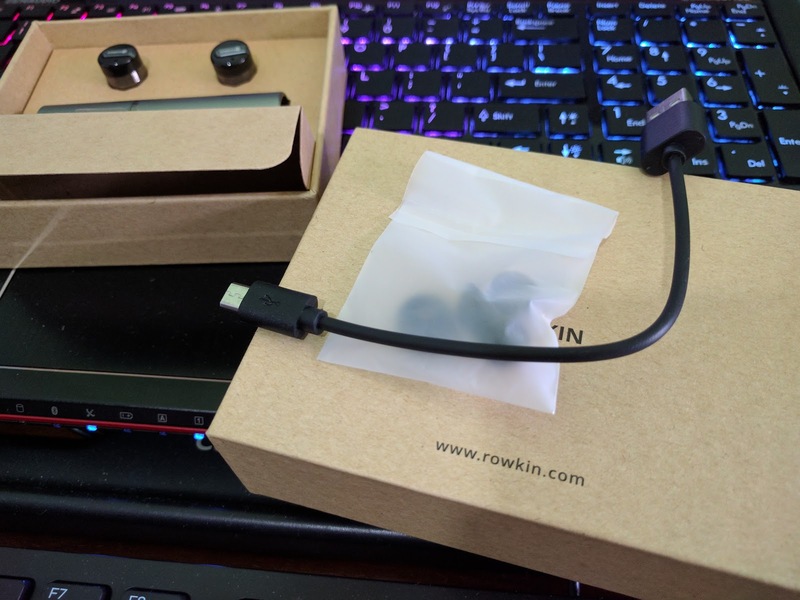 You should only see one device named "Rowkin Bit S" if the earbuds paired with each other correctly. Once pairing with your device is complete, one earbud will have a single blink of white every few seconds, while the other will have a double blink. The one with the single blink is the primary, and should be used as the left earbud. The button of the primary is the one you use to answer calls, and control music. To turn off, press and hold the button on either of the earbuds for 4 seconds, and they will both turn off (only when paired with each other). Mine was from Amazon. 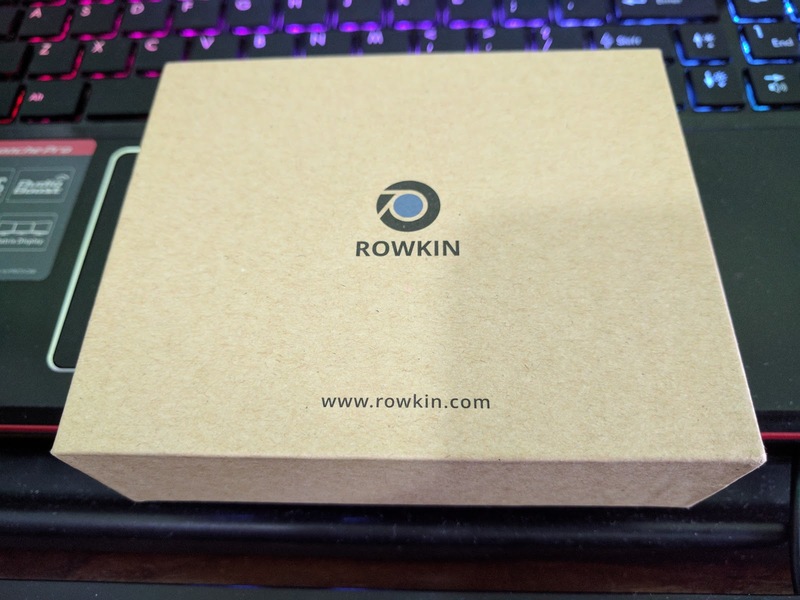 You can order from here - Rowkin Bit Stereo Bluetooth Headphones. Amazon's been putting a lot of emphasis on it's Echo device range, the Alexa AI enabled smart devices. 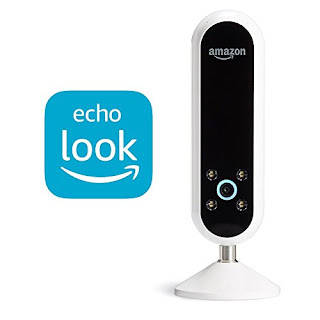 Now, with already 3 Echo products - The Echo, Echo Dot, and Echo Tap - Amazon now introduces the Echo Look - an Alexa enabled Smart Camera. It works like a hands free selfie camera. Being Alexa enabled, you can activate it by saying "Alexa, take a picture", or "Alexa, take a video". It takes full-length photos and videos - tall, not wide. It's meant to be used as a fashion and style assistant. With the companion app that comes with it you can view a 360-degree view of your outfit in real time. With the companion app, you can keep a 'personal lookbook' of your outfits, and it has the option to enhance your outfits in the photos with computer vision techniques. But the most exciting feature of it would be the "Style Check". Basically, you take two photos of you with two different outfits, and the Echo Look will use advanced machine learning algorithms to say which one works best for you, based on how it fits, the colors, the styling, and the current trends. The Echo Look is currently available by invitation only. You can check it out at the Alexa Products Page at Amazon. 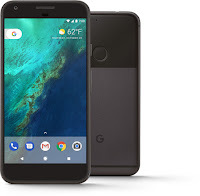 Google has revealed when the current Nexus and Pixel phones (and tablets) will loose support. That is, when will Google send out the last security patches for those phones. Do you own an Amazon Echo Dot? And are you disappointed that it's not portable enough? The Echo Dot is the perfect size to be portable, but having to plug it in always makes it a bit of a hassle to take it with you. Sure, Amazon already has a portable Alexa-enabled device - the Echo Tap. But with a price more than twice that of the Echo Dot, maybe you're looking for a more economical solution. 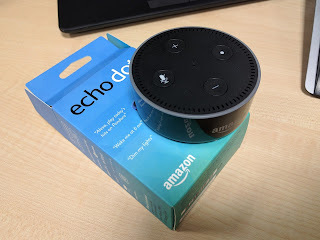 Wouldn't it be cool if there is sort of a power-bank adapter that turns your Echo Dot portable? Well, good news! Because that's exactly what the Fremo Evo is. Fremo Evo is an intelligent Battery Base for the Echo Dot - specifically, the 2nd Generation Echo Dot. 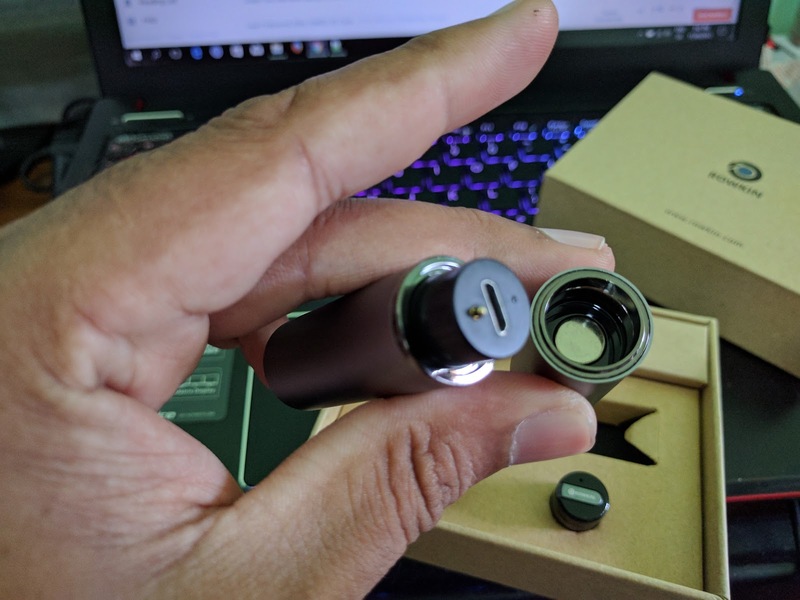 The Evo is designed so that the Echo Dot magnetically latches on to it, and has a connector that powers the Dot from the 5200mAh battery of the Evo. The Evo can power the Echo Dot for 6 hours from a full charge. And the Evo itself can be charged by plugging in the same cable and power adapter that came with the Echo Dot. 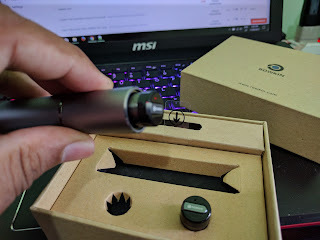 The charging circuit is intelligent enough so that you can keep the Dot connected to the Evo plugged in to the power adapter, and only disconnect the power adapter when you're taking the Dot with you. It also has a 4 light charge indicator to show how much charge it has left. Get your Fermo Evo here at Amazon, and make your Echo Dot portable! Amazon Echo Dot is awesome. It's small, inexpensive compared to other smart devices, and packs all the features found in many other smart devices. It's the cheapest among the 3 Echo devices - the original Echo, the Echo Dot, and the Echo Tap. And it's more awesome when you have several Echo Dots setup around our house. Amazon knows this too. That's why they now give a discount when you buy 3 Echo Dots. In order to get the discount you need to buy 3 Echo Dots, and you need to use the promo code DOT3PACK during the checkout. Remember, go to the Echo Dot product page, and set the Qty to 3 before you click Add to Cart. And then, at the checkout, use the promo code DOT3PACK. The discount will be evenly spread across all 3 Echo Dots. It should be made as a single order, and don't use 1-Click ordering. And one customer is limited to one 3-packs of Echo Dots with the offer. You can check the full details of this offer at the Terms and Conditions page. The offer is only available until 25th April 2017, so you should hurry up if you want to buy. If you are a serious photographer, you'll probably know the importance of good memory cards for your camera. Whether your camera is a DSLR, Mirror-less, or a Point-and-shoot, your images gets stored in the memory card, and if the card's not up to the standard, you're going to miss a lot. A non-capable memory card may mean a missed once-in-a-lifetime shot. When it comes to High-end SD cards for digital cameras, Lexar is considered one of the top. Although expensive, they have good build quality giving durability, and more importantly, unparalleled higher speed. The Lexar Professional 2000x is one of the fastest SD cards in the market currently, giving a 300MB/s speed. The package includes a high-speed SD UHS-II reader which give the full speed of the card, which is a nice touch since it's quite hard to find quality USB 3 compatible card readers. I've been using Lexar SD cards with my DSLR camera for years (although, I've been using the Lexar 1000x 150MB/s cards mostly). And I can say that the speed they give is unparalleled. They really shine at Wildlife and Sport photography, where speed is a must. I do a lot of wildlife photography, specially bird photography. And I have practically experienced that a slight delay where your camera is trying to write an image to the card could mean missing of a once-in-a-lifetime shot. I assume it would be the same with sports photography as well. Having a high speed Lexar card avoided a lot of otherwise missed opportunities. Apart from the speed, the other thing Lexar cards has given me is reliability. I have worked with them on sub-freezing temperatures - at -20C during a snowstorm at Boston, MA - to high-humid and scorching hot environments - northwest Sri Lanka during the sunniest of the year. And in all of those environments, the cards worked perfectly, they delivered the speed, and preserved the shots I captured. Yes, Lexar cards are expensive. But I think they are worth the investment. Once you capture a once-in-a-lifetime shot, then you will feel that the investment is worth it. 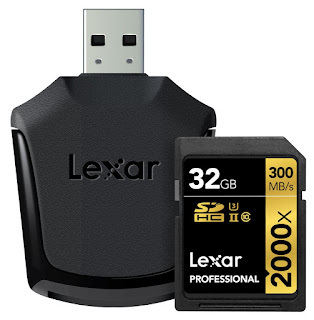 Get your Lexar Professional 2000x 32GB SDHC here at Amazon. Remember, these are the highest speed SD cards in the market right now. Thimira Amaratunga is a participant in the Amazon Services LLC Associates Program, an affiliate advertising program designed to provide a means for sites to earn advertising fees by advertising and linking to amazon.com.